One of my goals for 2012 was to produce “show quality” work. I wish I could say that I’m there, but I’m not. Angela Walters talked about Sue McCarty in one of her posts this week, and mentioned that Sue spent 850 hours on her latest show quilt. I’ll never be at that level of work. But show quality to me just means that you’re ready for the world to see your work and judge it favorably– I’m not talking about show quality at the winning level. So, even though I’m not ready, in the past year, I have had a few clients’ quilts in local shows. Unfortunately, they weren’t quilts that I would have chosen to be the best representation of my work. Yes, they were beautiful quilts, but, they weren’t quilts that I felt that my quilting brought them to that level where you stood back and really were intrigued by what I did to them. So I decided that I needed to put a quilt out there that I thought showed what I can do and where I am right now because I’m afraid if I don’t force myself to enter a show, then I’ll sit here forever without putting my work out there. 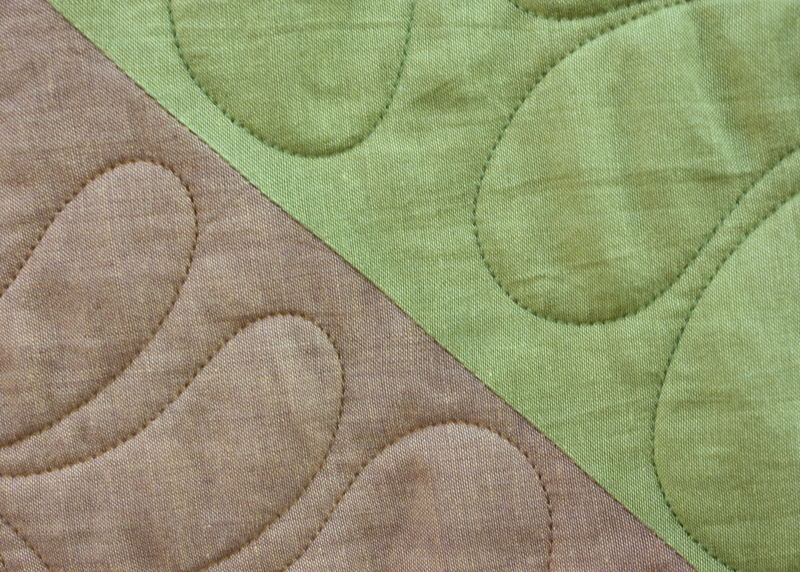 I started by thinking about the very best quilting I’ve done. I can feather. Not elaborate feathers. Not heirloom feathers. Not Amish feathers. Not even feathers with interesting spines. Just some nice feathers. So I decided to piece a quilt to show my feathers. 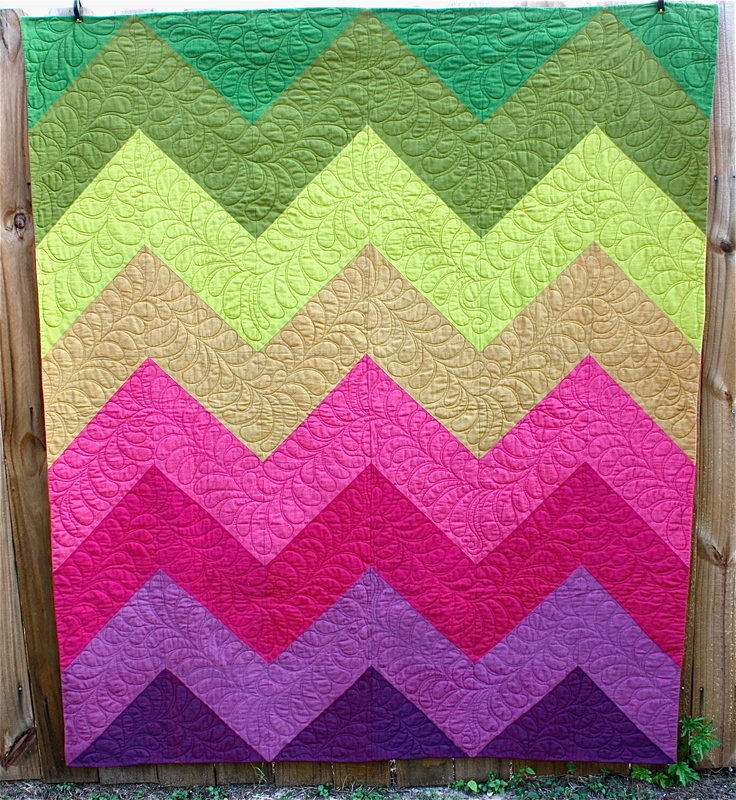 Meet the shot cotton feathered chevrons show quilt. 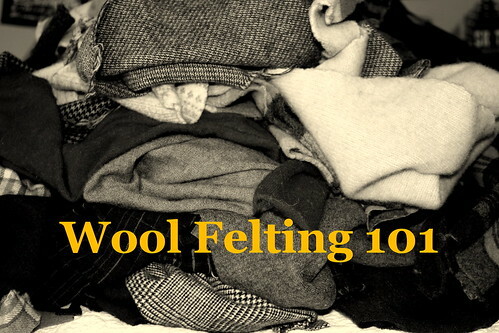 All the fabrics were shot cottons, my favorite solids right now. Each chevron was quilted with a different thread color so that the thread didn’t become the focus. As for the binding, I didn’t want it featured, so I wrapped it behind the quilt so that it wouldn’t show. 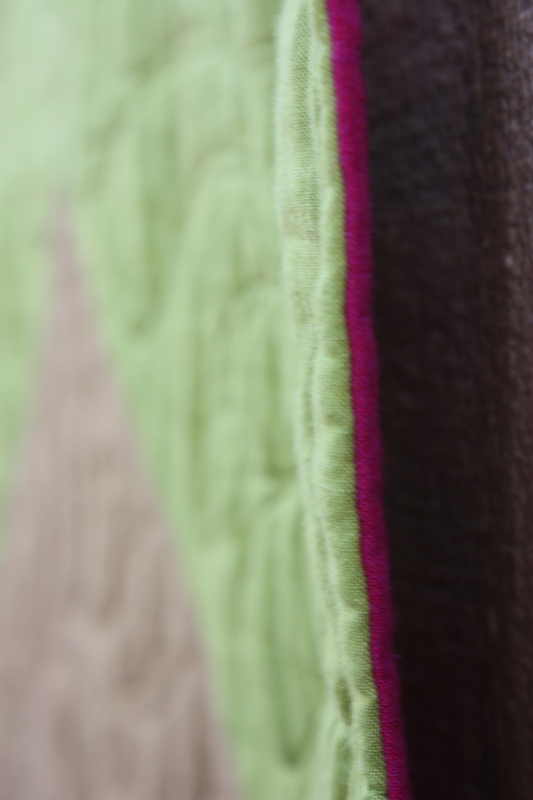 I used silk batting since this quilt wouldn’t be washed much and the drape was nice. And check this out. I entered it in the local New Braunfels Quilt Show and won second place in the wall quilt category! I’m so honored because I truly did not think I would win anything. The show is very traditional. Most of the quilts have an amazing level of workmanship and this, quite frankly, just wasn’t a technical piece. But they liked it, and most importantly, I’m glad I took a risk and entered it. Congratulations, Danielle!!! On a beautiful quilt (I really like this one on many levels), on winning a ribbon, but~as you said~most importantly, for putting yourself out there! Well done in all ways, it is eye catching, quilted beautifully and helped you reach a goal. 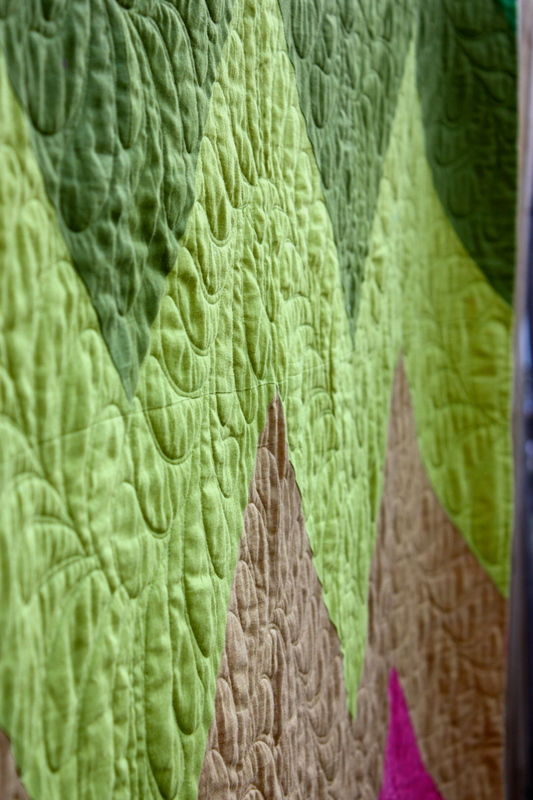 You should consider entering it in the QuiltCon show also. It is modern and beautiful. Way to go! Great job, Danielle…the first of many awards to come!!! Love the colors, and the design is perfect to showcase your quilting. Keep on being bold! Just found your blog through Instagram and have been reading some. I’m from San Antonio but living in Oklahoma (where they call queso “cheese dip”) right now…my husband works for Valero and was transferred here…and I’m so homesick! I love hearing about things going on around town and the pictures of your quilts at the Botanical Gardens are gorgeous! I’m going to start following you on IG so I can catch any more pictures you post of home. 😉 And congrats on your win in New Braunfels!! Congratulations! It’s a fabulous quilt! The colors are stunning! Gorgeous! Sara E. directed me to here, and I’m loving your work!